The Stirling Arcade was designed and built between 1881 and 1882, by William Crawford, a china merchant and Town Councillor at a cost of around £20,000. The Arcade has long been an important feature in the city centre due to its prominent location right in the heart of the old town. It stretches from Murray Place (near the railway station) to King Street at the foot of the Castle Rock. Throughout its long history the building has had a variety of different names including the Stirling Arcade, Alhambra Arcade and Crawford Arcade. The black and white photograph is from the collection of the Smith Art Gallery and Museum and date from the late 1930's. In its early days the Arcade housed two hotels - the Douglas Hotel in Murray Place and The Temperance Hotel in King Street - as well as residential flats, around 40 shops and two workshops, making it a real hub of the city. Tenants included a draper's saloon, rubber goods shop, tea merchants, jewellers, a licensed house, a restaurant, a fruiterer and a billiard hall. William Crawford died in 1894 and his family later sold the Arcade. 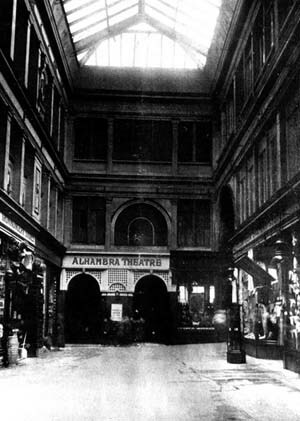 In the centre of the Arcade stood the Alhambra Theatre with it's its offices and three small halls, which were designed by Stirling architect John McLean. The theatre had previously served as Stirling's town hall and in its heyday played host to many well-known music hall artists. It later became a cinema but closed down around the time of the Second World War and fell into disrepair. The Grade B listed, Alhambra Theatre is currently unused and hidden behind retail units. There is an ornate twisting staircase in the entrance and the form of the auditorium is still evident and fragments of plaster decoration have survived. The imposing facades at both ends of the building stand four storeys high while the connecting walkway spans two storeys. Inside, there are beautifully restored period features capped off with a stunning glass roof which allows light to flood into the Arcade's central walkway. The Arcade recently benefited from an extensive renovation and redecoration programme, the result of which is a unique shopping environment where stunning architectural features and traditional values meet contemporary retail and business units.